Cell morphology is determined by the cytoskeleton, a "cellular skeleton" that gives cells their unique shape, much as our skeletons determine the shape of our bodies. The cytoskeleton is a mechanical scaffold, a phrase which brings to mind the mechanical structures that support human construction projects. Like scaffolds built by humans, the cytoskeleton is built from different structural elements: (a) microtubules, which can loosely be thought of a "poles", (b) actin filaments, which can be thought of as wires, and (c) intermediate filaments, which can be thought of a ropes. Using its combination of poles, wires, and ropes, our cells build an internal framework to give themselves shape. The subject of our research is the microtubule cytoskeleton. Microtubules are long, slender polymers of the protein tubulin (right), from which the cell constructs the cytoskeleton, the mitotic spindle, axonemes, and neuronal processes. These structures are not static. Rather, microtubules are broken down and rebuilt as the cell grows and changes shape, undergoes differentiation, and progresses through the cell cycle. Our aim is to understand the means by which cells accomplish these remarkable rearrangements of their microtubules. Cells rearrange their microtubules through the action of microtubule-associated proteins (MAPs). 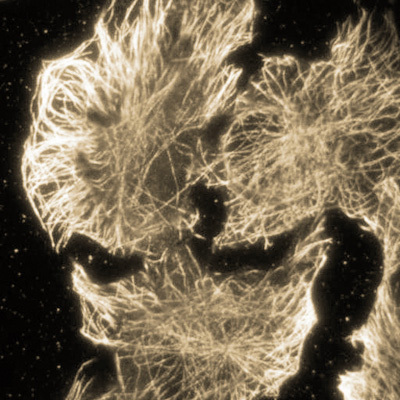 Our lab uses cutting-edge microscopy techniques, advanced biochemistry, and quantitative image analysis to figure out how MAPs do their job. Click on our Research Projects page for more details.